Randal Grant Kleiser is a Second Year History Ph.D. student at Columbia University researching the Early Modern Atlantic World and Eighteenth-Century commercial policy in the Greater Caribbean region. While tempting to use some overarching term to explain Trump’s unpredictable approach towards commerce, these pieces fail to assess accurately both early modern European trade policies and Trump’s own actions. Their characterization deludes readers into thinking Trump follows some coherent commercial plan. To try and predict the President’s behavior we have to shed our tendencies to place a label on him. Based on these columnists’ definition of the term, “mercantilism” was a commonly-held ideology that assumed trade was a barbaric battle among competing empires for limited resources. These empires felt they needed to achieve a favorable balance of trade to maximize their wealth in the form of imported gold and silver. To augment state power and wealth at the expense of their rivals, rulers encouraged exports and discouraged imports other than hard cash. These writers assert that this attitude experienced a complete 180-degree shift in the nineteenth century. Economists such as David Ricardo began convincing policy-makers that unbridled, un-tariffed, international trade could benefit all. Based on the principle of “comparative advantage,” various countries can specialize in producing certain goods and trade for other products. Nations can thus take advantage of cost efficiencies and become richer than they would have been under autarky. After World War II, the “Western” world enshrined its commitment to such principles in institutions such as GATT (the General Agreement on Tariffs and Trade) which then became the WTO (the World Trade Organization). These organizations attempted to reduce tariffs and other restrictions on international free trade. President Trump, however, has apparently “brought mercantilism back,” thinking that the key to the United States’ economic future is to “balance” our trade relationship with China through high tariffs on Chinese imports. The first problem with characterizing Trump as a “mercantilist” is that this definition of “mercantilism” is an ill-defined and inaccurate assessment of early modern European commercial policy. Recent historians have eschewed the word “mercantilism,” arguing that it wasn’t even used in the seventeenth and eighteenth centuries. The term also falsely betrays a sense of unified and perennial goals and practices. Many politicians, writers, traders, and clerics at the time thought that trade was not a battle among rival countries for a scarce pool of wealth. Take England for example, and the famous colonist of Jamestown Virginia, John Smith. As the historian Steve Pincus has shown, unlike his near-contemporary Sir Walter Raleigh, Smith did not believe that commerce was a vicious competition for limited resources. Smith thought that colonies could create new wealth through proper organization, labor, and commerce with other empires. “Mercantilism” was not a coherent ideology based on consensus, but rather vague ideas subject to intense debate and often rejection. European empires often enacted decrees to facilitate needed imports, going against the “mercantilist” logic. Throughout the seventeenth and eighteenth centuries, Spain allowed specific Spanish American ports to receive enslaved Africans from foreign merchants. The British Navigation Acts, first instituted in the 1650s, permitted British merchants to travel to foreign colonies for trade in specified goods, encouraging some foreign imports other than gold or silver. And in the 1760s, France established various “free ports” in the Caribbean that permitted foreigners to import goods such as lumber, corn, rice, oats, and bricks into France’s American colonies. Just as “mercantilism” was a debated and incoherent assessment of early modern European commercial policy, so too does this term inaccurately summarize Trump’s vision for the United States’ foreign trade. Rather than eschewing all foreign imports and attempting to export American-made goods only for hard cash, Trump is more than willing to buy foreign oil from Saudi Arabia and Iran rather than develop American sources. And while Trump calls for increasing tariffs on foreign steel and Chinese manufactured goods, most of the Trump apparel, Trump home items, Trump merchandise, and Trump beverages have been produced overseas. And rumors are now floating that Trump might try and roll back many of the Chinese tariffs in order to appease U.S. investors at a time of increasing political vulnerability for him. 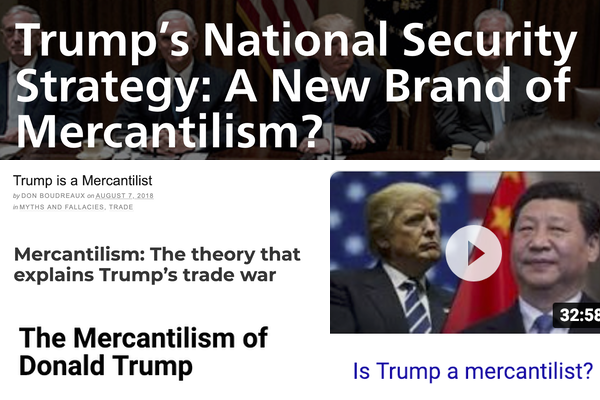 Characterizing Trump as a “mercantilist” misleads the public into thinking he follows a stable, precedented, and predictable ideology on trade. His actions are as varied as European commercial policy actually was in the early modern period. In reality, the only commercial mantra Trump ascribes to is “Trumpism.” Based on past experience, Trump will do whatever he thinks will energize his base and benefit his political and economic future. Of only that can we be sure.